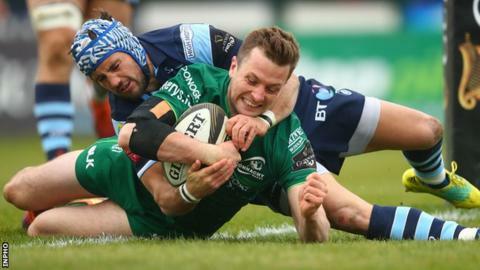 Connacht earned a place in the Pro14 play-offs at Cardiff Blues' expense with a wind-assisted win in Galway. Jack Carty kicked 14 points while Gavin Thornbury, Caolin Blade and Matt Healy also crossed as the hosts clinched third place in the Conference A table. Owen Lane, Josh Turnbull and Jason Harries scored for Blues but a TMO call to deny another Harries try was costly. Ospreys and Blues will now be vying for the final European play-off spot in their Judgement Day match on 27 April. Connacht will travel to Belfast for an inter-provincial quarter-final against Ulster in three weeks. The losing bonus-point means that Blues trail Ospreys by a point before their Principality Stadium showdown with the two teams who finish fourth in the conference tables taking part in a play-off for the final Champions Cup place for next season. As is so often the case in Galway, the weather dictated how both teams had to approach the game at the Sportsground. Playing into the teeth of an Atlantic gale, Cardiff adopted a conservative playing style in the opening half as Gareth Anscombe avoided kicking from hand at all costs and the visitors struggled to get out of their own half. Carty missed his opening shot at goal in the unpredictable breeze but hosts took the lead through half-back partner Blade in the 12th minute - the scrum-half dashing onto a pop pass from Paul Boyle after the flanker's galloping break up the middle. The conditions were forcing the Blues to play a high-tempo game to keep possession and a rare foray into the Connacht half was rewarded with a clinical try by Lane - his ninth in as many matches. The hosts knew they needed to build a lead while playing with the wind and Boyle again played an instrumental role as he won a muscular turnover penalty and the Connacht pack mauled Thornbury over from the resulting line-out. Carty scored a magnificent conversion from the touchline but the fly-half saw a more straightforward penalty blown off course just minutes later as Connacht had to settle for a seven-point lead at the break. Connacht's greater experience of the conditions in Galway allowed them to adapt their game in the second half as Carty drilled a penalty that just broke the plane of the posts before he finished off an attack that began with a quick line-out on the Connacht five-metre line and ended with the fly-half chasing down his own grubber kick to score. Anscombe responded with a penalty and the visitors thought they were back in the contest just after the hour when Connacht surrendered possession in their own 22 and Harries touched down in the left corner only for the TMO to rule that the winger's little finger had brushed the touchline to hand the home side a reprieve. The Blues eventually got the try their pressure deserved when Turnbull drove over from a line-out maul but from the restart Connacht pushed ahead after another agonising TMO deliberation as Matt Healy pounced on a bobbling ball to score with millimetres to spare. Cardiff head coach John Mulvihill had described their visit to Galway as a Grand Final for his side and the visitors continued to press for another score with Harries eventually getting over for a try from Anscombe's one-handed offload but Connacht were able to see out the closing seconds to clinch their quarter-final berth. Connacht: O'Halloran; Leader, Farrell; Aki, Carty, Blade; Buckley, Heffernan, Robertson-McCoy; Dillane, Thornbury; Boyle, Fainga'a, Butler (capt.). Replacements: Delahunt, Burke, Carey, Cannon, Copeland, Marmion, Daly, Kelleher. Cardiff Blues: Morgan; Lane, Lee-Lo, Halaholo, Harries; Anscombe (capt. ), Williams; Gill, E Lewis, D Lewis, Earle, Thornton, Turnbull, Robinson, Davies. Replacements: Belcher, Carre, Arhip, Lewis-Hughes, Botham, Williams, Evans, Smith.